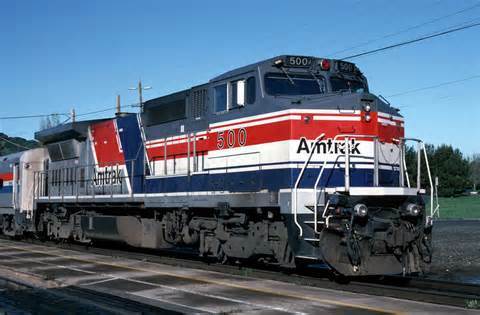 Scroll down for Travel Cheap Deals, budget-friendly accommodations, inexpensive local activities, and a route map of Amtrak destinations. Find many fun, free (and low cost) things to do. Get the lowest possible airfares and hotel rates. Learn about local public transportation systems. Click on any of the states listed below to minimize travel costs to any state in America and Washington DC. ALABAMA - Low-cost travel and local treasures that don't cost a fortune. ALASKA - Trip packages and top destinations. ARIZONA - Golf courses, natural wonders and more. ARKANSAS - Historical treasures, natural wonders, diamond hunting and more. CALIFORNIA - Beach vacation rentals, low-cost accommodations, best restaurant deals and transportation options. COLORADO - A budget traveler's paradise. CONNECTICUT - Sights, hotels, local attractions, transportation. DELAWARE - You'll be surprised at how many interesting things there are to do in Delaware. DC - Amtrak Jobs and DC destinations. FLORIDA - Travel Cheap Deals to and from, and cheap hotels throughout the state. 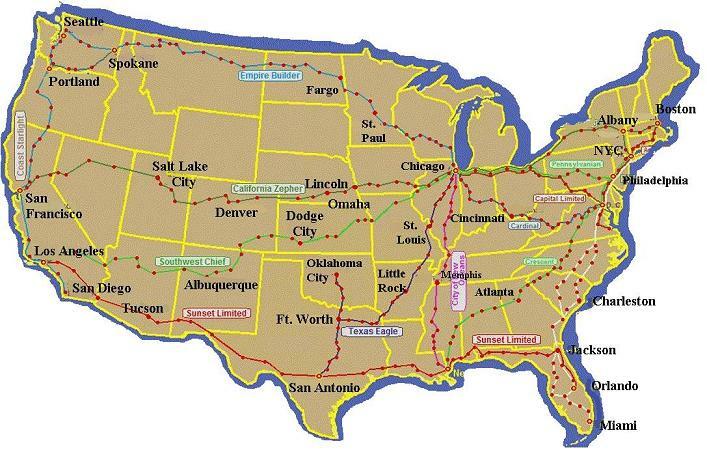 Above: A map of Amtrak passenger train routes. GEORGIA - Where and when to travel to Georgia, and getting around via Atlanta. HAWAII - Cheap flights, discount deals and travel tips. IDAHO - A favorite U.S. destination for rugged, outdoorsy people on a budget. ILLINOIS - Things to see and do, in and out of Chicago. INDIANA - A rewardingly cost-effective vacation idea. IOWA - Hiking the Heartland, best urban destinations, and more. KANSAS - Getting around made easier. KENTUCKY - How to make inexpensive travel plans. LOUISIANA - Cheap hotels in New Orleans and other discount deals. MAINE - Cheap lobsters and other sweet deals. MARYLAND - What to do in Maryland and surrounding areas. MASSACHUSETTS - Boston and beyond. MICHIGAN - Best destinations and how to get cheap travel deals online. MINNESOTA - discount travel plans and more. MISSISSIPPI- Travel Mississippi the easy way. MISSOURI - St. Louis and lesser known local wonders. MONTANA - Getting there and getting around. NEBRASKA - Exploring America's heartland. NEVADA - Budget friendly deals and vacation packages. NEW HAMPSHIRE - How to go and what to do. NEW JERSEY - Cool hotels, places to go, things to see. NEW MEXICO - Exploring the most beautiful places on earth. NEW YORK - The state and the city. NORTH CAROLINA - Visit, stay, and wander without breaking the bank. NORTH DAKOTA - One of America's most underrated destinations. OHIO - Cleveland, Columbus, Cincinnati, and more. OKLAHOMA - How to go and where to stay. OREGON - Tour the state on a budget. PENNSYLVANIA - Pittsburgh, Philadelphia, and lesser known local destinations. RHODE ISLAND - A list of budget-friendly travel ideas. SOUTH CAROLINA - Travel Cheap Deals to Myrtle Beach and throughout the state. SOUTH DAKOTA - Sights & scenery, transportation options and more. TENNESSEE - Party Bus Rentals, music venues, motorcycle tours, whiskey, and more. TEXAS - Discount transportation and unique vacation ideas. UTAH - Bus Charters, natural wonders, balloon rides, and more. VERMONT - Trains, Planes, and Snowmobiles. VIRGINIA - Vacation beach packages and historic sites. WASHINGTON - Amtrak vacations and more. WEST VIRGINIA - Berkeley Springs, the Appalachian Trail, and other family vacations. WISCONSIN - Budget travel ideas and more. WYOMING - Wildlife, Wildlife, and more Wildlife. View Fact and Photo Galleries for All 50 States. Get Low Cost Car Insurance in All 50 Sates. See Accredited College Courses and PhD Programs in All 50 States. Work From Home in All 50 States. Go here for Factory Outlet Malls everywhere.